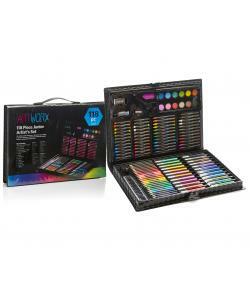 Get crafty & imaginative with the Artworx junior art set. 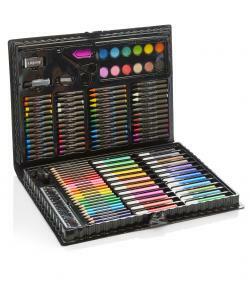 118 pieces including colouring pens, crayons, oil pastels, paints, colouring pencils. Keep the contents safe & your home clean with the handy, robust storage case, each piece has it's own dedicated place. 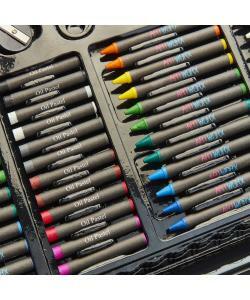 Budding young artists can colour, doodle, sketch, paint or sketch oil drawings with this all in 1 set. 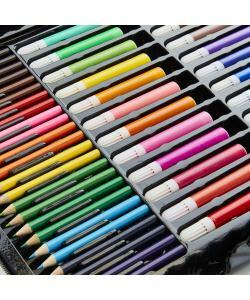 Art set content:24 colour felt tip pens, 24 pencil crayons, 24 24 wax crayons, 24 oil pastels, 12 paint tablets, plastic paper clip, ruler, HB pencil, eraser, pencil sharpener, safety scissors, paintbrush, pigment tray, stapler. Safe and Fun: All Artworx products made from the highest quality materials and are tested to all EU standards including EN71 Parts 1-3. 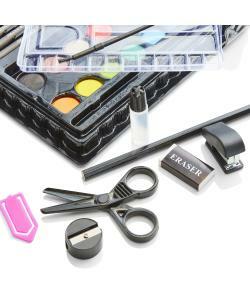 The ArtWorx 118 Piece Mixed Media Art Set is full with artist's essentials that will get you started on route to your first masterpiece. This fantastic, colourful set is the perfect way to get started as an artist or add depth to your work whether you are a beginner or intermidiate.